In 1917, the original “Salvation Army Doughnut” was first served by the ladies of the Salvation Army. It was during WWI that the Salvation Army Lassies went to the front lines of Europe. Home cooked foods, provided by these brave volunteers, were a morale boost to the troops. The doughnuts were often cooked in oil inside the metal helmets of American soldiers. American infantrymen were then commonly called “doughboys.” A more standard spelling is donut. 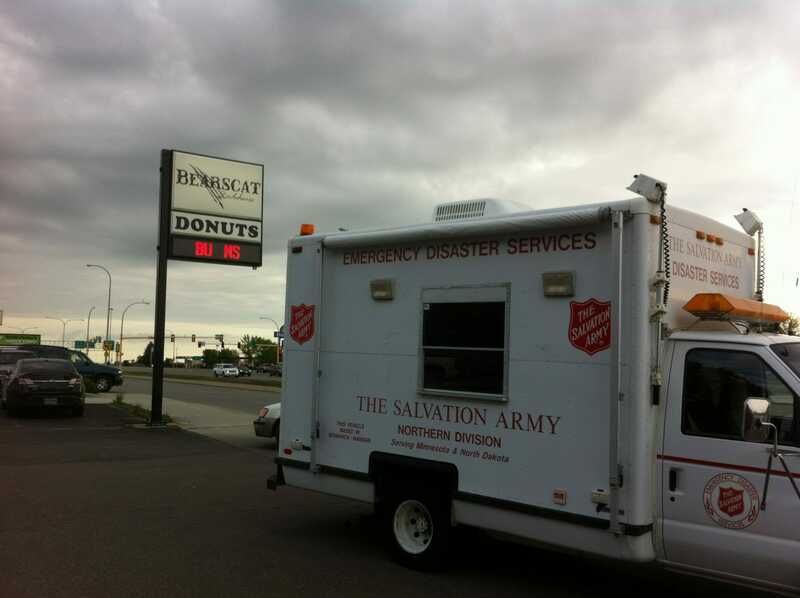 Salvation Army truck sitting in front of Bearscat Bakehouse in Bismarck, ND. On this day, many bakeries and coffee shops in the United States offer doughnut deals to their customers. Celebrate the day by enjoying your favorite doughnut. Use #NationalDonutDay or #NationalDoughnutDay when using social media. National Doughnut Day was created by The Salvation Army in 1938 to honor the women who served the doughnuts to soldiers in World War I. This day began as a fund-raiser for Chicago’s Salvation Army. The goal of their 1938 fund-raiser was to help the needy during the Great Depression. Everyone is sure to enjoy marking National Leave the Office Early Day on their calendar. Observed each year on June 2nd (unless June 2nd falls on a weekend, at which time it would be acknowledged on the closest working day) National Leave the Office Early Day is an incentive to many who often work more than 40 hours each week. On this day, upon completion of all the necessary day’s work and the needed approval, it is suggested that you can then leave work early to enjoy the rest of the day with fun activities of your choosing. Use #LeaveTheOfficeEarlyDay to post on social media. National Leave The Office Early Day was created by Employee Productivity Specialist, Laura Stack. On National Say Something Nice Day we have an opportunity to make June 1st extra pleasant for everyone. The purpose of this holiday is to counteract bullying and the lack of civility and common courtesy that is growing among people in today’s world. Hopefully, the practice of saying something nice today will continue onto all tomorrows. Mayor Keith Summey of North Charleston, South Carolina proclaimed June 1 as Say Something Nice Day in 2006 in recognition of the communication efforts of specialist Dr. Mitch Carnell founder of the day. Carnell is also the author of Say Something Nice: Be a Lifter at Work. The South Baptist Convention and the Charleston-Atlantic Presbytery joined with Carnell to establish the day. Now is a good time to clean out your closets and donate a pair or two of gently used shoes to a charitable organization in your area or see the following for information: Soles4Souls organization. Use #GoBarefootDay to post on social media. National Go Barefoot Day was created by the people at Soles4Souls. The holiday got its start after the Tsunami disaster in 2004 to support those affected by the event. However, donations have continued to come in and over 19 millions of pairs of shoes have been donated worldwide since 2005. National Olive Day is observed annually on June 1. The olive, one of the world’s oldest fruits, is part of a traditional meze/tapas culinary experience that brings families and friends around the table to share time together rather than in a kitchen. The olive branch is a symbol of peace, hope, love and friendship and celebrating National Olive Day is a fun way to acknowledge the joy this little fruit provides. Olives are used in many ways. We find them in cocktails and loaves of bread. We eat them whole as snacks, use them as toppings, include them on relish trays and even use them as a garnish for many foods. They are one of the most versatile foods we eat. Take photos of your favorite way to eat olives and post them on social media using #nationaloliveday. National Olive Day was submitted by Divina and proclaimed by the Registrar of National Day Calendar in July 2015. Observed each year on June 1, National Pen Pal Day is a way to let your pen pals know how much they mean to you. The day is the perfect day to send special letters and gifts to your pen pals. A pen pal is someone with whom you correspond by writing letters, sharing personal events and many times have never even met. Use #NationalPenpalDay to post on social media. National Pen Pal Day was created by American pen-palist, Rosie Tholl, who has traveled around the world to meet some of her pen pals. She was also the co-coordinator of the Illinois Pen Pal Picnic Reunion and is co-found and co-coordinator for Pen Pals United. June 1st is a day to spend some time in the kitchen baking up a delicious hazelnut cake as you take part in National Hazelnut Cake Day. Enjoy this Hungarian Flourless Hazelnut Cake recipe. Use #HazelnutCakeDay to post on social media. Within our research, we were unable to find the creator of National Hazelnut Cake Day. Your National Day pictures are starting to look more like advertisements than National day logos. Look at National Nail Polish Day. Your giving in to the money. So sad……. How can I start a national day?